racing through human trials with drugs that show unparalleled promise of being able to control cancer, as well as other deadly diseases. For the creation of this book, Dr. Judah Folkman cooperated fully and exclusively with acclaimed science writer Robert Cooke. He granted Cooke unlimited interviews, showed him diaries and personal papers, and threw open the doors of his lab. The result is an astonishingly rich and candid chronicle of one of the most significant medical discoveries of our time and of the man whose vision and persistence almost single-handedly has made it possible. Dr. Folkman's radical new way of thinking about cancer was once considered preposterous. So little was known about how cancer spreads and how blood vessels grow that he wasn't even taken seriously enough to be considered a heretic. Other doctors shook their heads at the waste of a great mind, and ambitious young medical researchers were told that accepting a position in Folkman's lab would be the death of their careers. Now, though, the overwhelming majority of experts believes that the day will soon come when antiangiogenesis therapy supplants the current more toxic and less-effective treatments — chemotherapy, radiation, and surgery-as the preferred method of treatment for cancer in patients around the world, and Dr. Folkman's breakthrough will come to be taken for granted the way we now take for granted the polio vaccine and antibiotics. 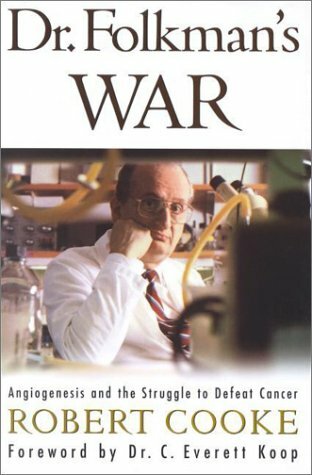 Dr. Folkman's War brilliantly describes how high the odds are against success in medical research, how vicious the competition for grants, how entrenched the skepticism about any genuinely original thinking, how polluted by politics and commerce the process of getting medicine into patients' hands. But it also depicts with rare power how exalted a calling medicine can be and how for the rare few—the brilliant, the tireless, and the lucky — the results of success can be world-changing.